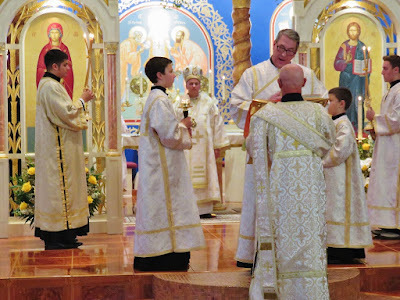 To me, and, I think, to most traditionalists, it is obvious that the Byzantine Divine Liturgy and the traditional Roman Mass are spiritual close relations, and that the Novus Ordo departs from the heritage they share in common. But one sometimes encounters Byzantine Catholics who, misled by superficial similarities between the Byzantine liturgy and the Novus Ordo (e.g., that they are often done in a vernacular language audibly pronounced) and by the obvious differences between the Byzantine liturgy and the traditional Roman rite (e.g., that there is much more silence in the latter than in the former, and that the people seem to play a more “active” role in the one than in the other), maintain that the Byzantine and Novus Ordo liturgies are spiritually more akin, and thus, when presented with a choice, will choose the Roman usus recentior over the usus antiquior. Indeed, protagonists and apologists of the Roman liturgical reform often pretend to be admirers of the Eastern tradition and like to point out the many seemingly “Eastern” features of the neo-Roman liturgy. 2. The Principle of Mystery. Each of these liturgies exhibits the principle of mystery: the liturgy is palpably sacred, a work and a wonder that God does in our midst, to which man is permitted to unite himself in fear and trembling. Traditional liturgy is like a cloud in which God dwells, and unto which Moses dares to approach. There is no sense of a meeting with an agenda, conducted by company managers, characterized by a lot of reading of texts and sharing out of tasks. We lie prostrate on holy ground before the burning bush of divine self-revelation. 3. The Principle of Elevated Mode. 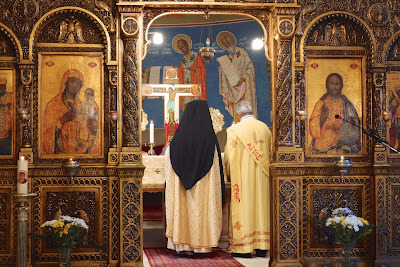 The prayers and lessons of traditional Eastern and Western liturgies are either chanted by cantors, deacons, subdeacons, and choirs, or whispered in the sanctuary by the priest, but never merely recited like the daily news or a school lesson. Part of this elevation is the use of what we might call “high language.” In the East it takes the form of exquisite poetic compositions; in the West, of venerable Latin locutions. Latin is as truly, properly, and definitively the language of the Roman Catholic Church as the vernaculars are the languages of Eastern rites. [NOTE: Readers have taken exception to my claim that the languages of the Eastern rites should be called vernacular without qualification. See Note *** appended to this article.] Something that has endured for 1,600 years in the West is not a random accident but a constitutive principle, as none other than Pope St John XXIII declared in his Apostolic Constitution Veterum Sapientia, signed on the altar in St Peter’s in 1962. Those who attend the usus antiquior are well aware of the powerful effect on the faithful of the ceremonial use of an ancient language that has acquired a numinous force with the passage of time. The very fact that this language is specially set apart, consecrated as it were for the public worship of God, objectively represents and subjectively induces that separation of sacred from profane that is at the heart of sacrificial religion. 4. The Principle of Ritual Integrity. Both the Divine Liturgy and the traditional Latin Mass pre-exist any given celebration as determinate, fully-articulated rites that clergy and people follow with humble obedience. The prayers, antiphons, readings, gestures, and chants are fixed and prescribed; above all, the most holy prayer, the anaphora, is either unchanging (in the West) or determined by the liturgical calendar (in the East). In this way, the celebrant’s personal preferences or choices are never driving the action. We may also call this the principle of stability, since the ritual integrity guarantees to the clergy and the people an immovable rock on which they may build their spiritual lives. 6. The Principle of Preparation. Closely connected with the foregoing is the principle of adequate and repeated preparation. In both East and West, the clergy and ministers prepare themselves thoroughly before the liturgy for their work, whether it be at a side table preparing the offerings with abundant prayers, or at the foot of the altar reciting Psalm 42, the Confiteor, and prayers of ascent. How could anyone imagine just sauntering out of the sacristy and walking right up to the altar, as if it’s no big deal? As if one were going to a fundraising luncheon? 7. The Principle of Truthfulness. The whole of the Gospel message is present in the traditional lectionaries — the so-called “difficult” parts, too, as well as the easier ones. In the Novus Ordo, as is well known, Scripture is heavily edited to conform to modern prejudices. More broadly, the traditional lex orandi contains and transmits with apostolic vigor the full lex credendi of the Catholic Church, without any editing for contemporary sensibilities or sensitivities. Thus, to take one example from a thousand, the damnation of Judas, and the real possibility of hell for any of us, is taught unflinchingly, while the cursing psalms directed against our spiritual enemies are made use of plentifully. This kind of thing is excised from or heavily reduced in the Novus Ordo. In this regard, it fails to pass on the fullness of the Faith as we find it in Scripture, the Fathers, the Councils, and the Doctors of the Church. In this way it fails in its role as lex orandi of the orthodox Church. In fact, many doctrines of the faith are seen and heard in the old liturgies, whereas they have to be studied and blindly accepted in the context of the neo-Roman liturgy, because the rite itself does not make them evident. As examples, consider the veneration that ought to be paid to the saints, or the adoration of latreia that ought to be shown to the Blessed Sacrament. 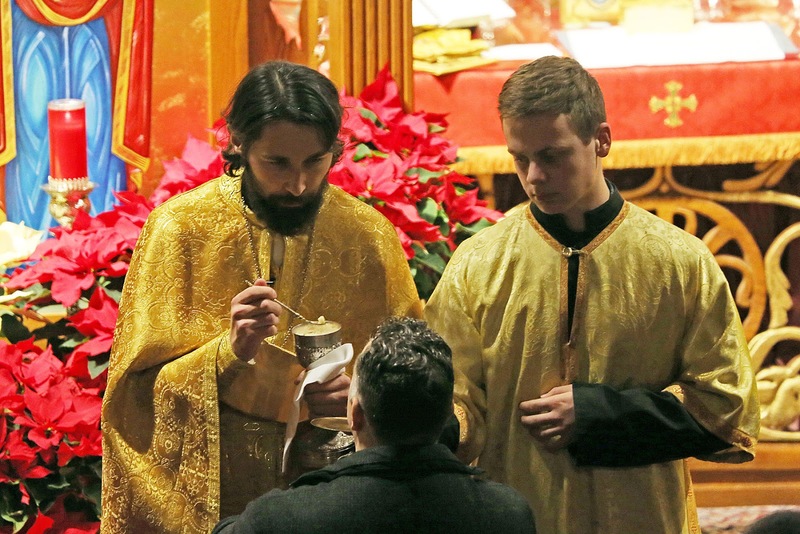 One who attends either the Byzantine or the traditional Roman liturgy will have a visceral experience of the venerability of the saints and the adorableness of the Eucharist. In contrast, the Novus Ordo has systematically pared down the focus on the saints  as well as the signs of reverence to be paid to the awesome mysteries of Christ. 8. The Principle of Hierarchy is manifest in the clear division of roles for priest, deacon, subdeacon, acolyte, cantor, etc. This non-interchangeable diversity of roles is grossly confused and diluted in the Novus Ordo, with its loose regulations on laypeople functioning in the sanctuary. 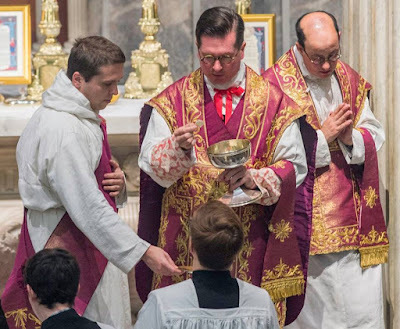 Neither Byzantine nor authentic Roman liturgy allows unvested laymen to enter willy-nilly into the sanctuary and perform works proper to the clergy, above all the handling of the Most Holy Eucharist. Rather, the identity of the priest as a mediator between God and man is thoroughly respected and demonstrated in action — and the identity of the layman as actively present to the sacrifice is likewise respected and demonstrated in action. 10. The Principle of Separation. All authentic Christian liturgies preserve and make ritual use of the theology inscribed in the architecture of the Old Covenant temple, which, as the Epistle to the Hebrews teaches, is recapitulated in Christ and therefore symbolized forever in our Eucharistic sacrifice. In the East, the separation of the sanctuary or holy of holies from the nave is more obvious due to the presence of an iconostasis through which only certain clergy may enter. In the West, curtains gave way to the rood screen, which in most places diminished into the communion rail, but always the sanctuary remained distinct, elevated, and off limits to the laity. Moreover, in the Western liturgy the visual iconostasis has yielded to a “sonic iconostasis” of Latin alternating with silence. Both the hieratic language and the enveloping absence of sound lower a veil over the holy of holies and shield the sacred mysteries from the profanation of casual treatment. Thus, while Eastern and Western liturgies accomplish this “veiling of our faces to the Presence” in different ways, both are highly effective in achieving it, powerfully drawing the worshiper’s attention to the hidden glory of God. 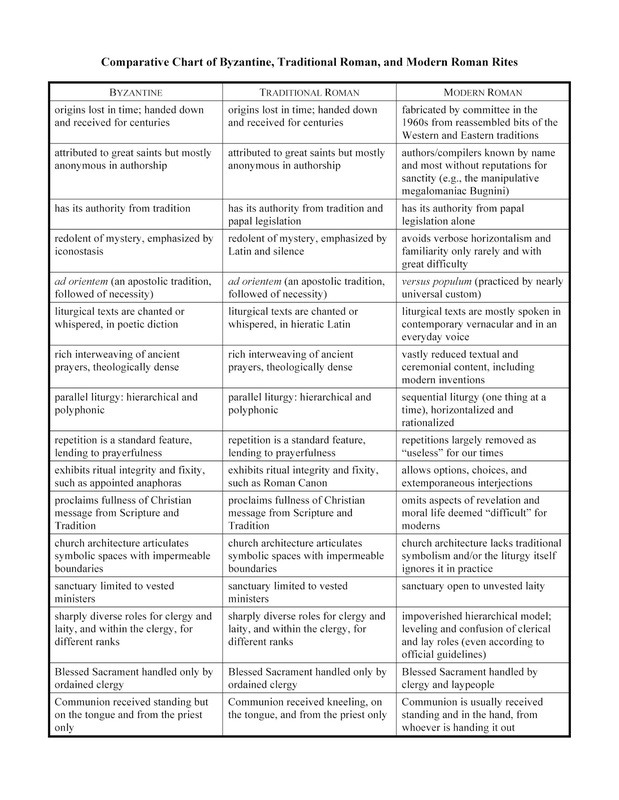 Beyond these principles, which evidently point to the very nature of divine worship, there is a whole host of things that are not necessarily characteristic of the Novus Ordo, and yet accompany it in 99% of its instantiations, such as the versus populum stance. After fifty years of clergy facing the people almost always and everywhere, with papal rebukes to those who dare to think differently, even the most optimistic proponent of the Reform of the Reform cannot maintain that versus populum does not typify the Novus Ordo in the minds of its architects, implementers, and end users. Compared to the Novus Ordo, the Byzantine liturgy looks like a king next to a pauper, a Rembrandt next to a caricature, a feast after a famine. But compared with the traditional Roman rite in all its intricate splendor and regimented solemnity, it is an equal at the table of tradition. We do an injustice to the Holy Spirit’s work in the Western Church by speaking as if Byzantine liturgy is the “gold standard,” when the Roman rite in its fullness — sadly, so rarely seen by Roman Catholics! — is fully its match. Instead, it is the Novus Ordo that should be shown the door, for it has no claim to be seated at the royal table of authentic liturgical rites. In that one difference alone, we can see the almost infinite gap that separates the modern Roman Rite from any historic rite of Christianity, Eastern or Western. Its lack of doctrinal, moral, rubrical, and ceremonial density, its modular-linear-rationalist structure, and its “optionitis” separate it in essence from the sphere of sacred culture that the Roman usus antiquior and the Byzantine Divine Liturgy inhabit in common. 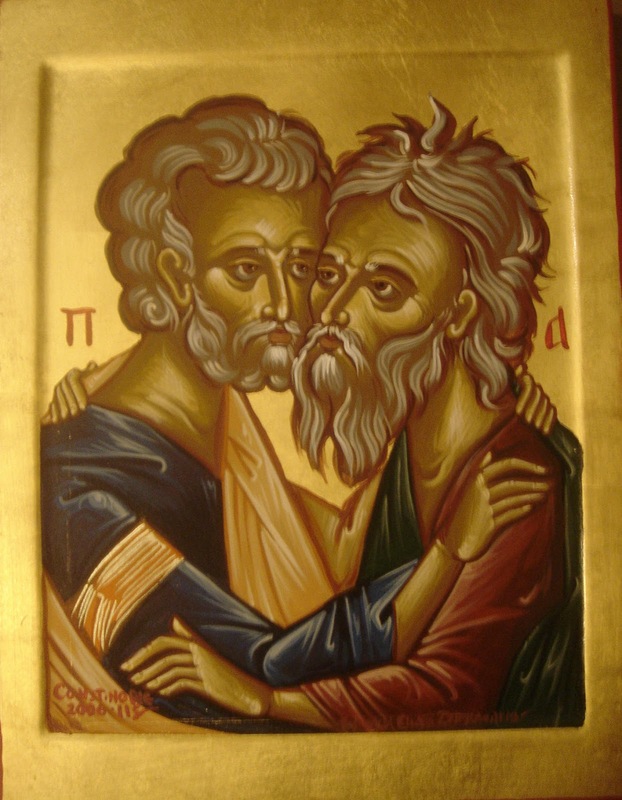 One might adapt to this situation the words of Abraham in the parable of Dives and Lazarus: “Between us and you, there is fixed a great chasm, so that they who would pass from hence to you, cannot, nor from thence come hither” (Lk 16:26). What is truly surprising, given the foregoing, is how many Byzantine Catholics and “experts” in Eastern liturgy — Robert Taft, S.J., being the most prominent — favor the “reformed” Roman liturgy, overlooking the monumental discrepancies and contradictions between its principles of composition and execution and those that are common, as I have shown, to Byzantine and traditional Latin liturgy. Indeed, it is no exaggeration to say that the Pauline liturgy, both as a whole and in its particulars, is a deformation of Latin liturgy that cannot be classified with authentic Catholic rites of history. 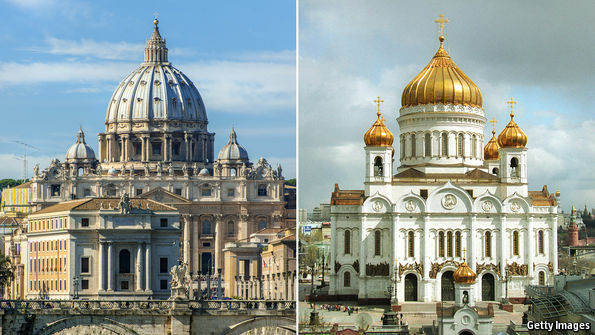 It is therefore due to a profound inconsistency that Byzantine Catholics would prefer the Novus Ordo on account of secondary or tertiary characteristics while overlooking, tolerating, or even seeming to approve of its deviations from fundamental principles of classical liturgy. This is no mere speculative issue. As we know, liturgists for decades have been talking about how to “reform” the Eastern Catholic rites to bring them into line with Sacrosanctum Concilium and Bugnini’s Bauhaus blueprints. The combined force of a prejudice in favor of multicultural pluralism, the inherent conservatism of the East, and the lack of a centralized authority capable of imposing gigantic liturgical changes has for now spared the Eastern rites of the worst excesses of the liturgical reform. But this fragile peace may not last forever, especially if church leadership continues to display the twin traits of arrogance and myopia that have afflicted their kind for the past fifty years. It therefore behooves every Eastern Christian and every Roman sympathizer to understand the errors that led to the Pauline rites and are thickly embedded in them, and to oppose any reduction, compromise, or novelty in their own liturgical life. To return to the beginning: Byzantine Catholics who love their own liturgical tradition will do well to expose themselves to the Western liturgical tradition as preserved and handed down in the usus antiquior, and — precisely out of love for what is common to East and West — to avoid the neo-Roman liturgy, with its mingling of inconsistent antiquarianism and modern novelties, its cognitive dissonance and rupture with Christian tradition. It is nothing less than a counter-sign to both the Greek and Latin traditions, contradicting age-old dogmatic and moral truths that the liturgy has always shown forth and inculcated in the faithful. Roman and Byzantine Catholics know themselves to be safe, in good hands, when attending one another’s authentic rites; but neither can feel safe attending the Novus Ordo. Geoffrey Hull in The Banished Heart shows that the problem of papal interference in liturgy goes back many centuries. Nevertheless, he recognizes the abyss that separates anything done by popes prior to Paul VI from the monstrous rupture Montini introduced. There is a difference in kind, not just a difference in degree. I know a Catholic philosopher who actually maintains that the only reason a rite of Mass is valid is because the Pope has declared it so, and that if the Pope wanted to gut all the content of the rite and replace it with something totally different, it would be a true Catholic rite as long as it contained the words of consecration. I am well aware that these prayers were built up over time, and that, e.g., the Last Gospel was a relatively late addition. But all the additions happened for good reason; they happened under the gentle influence of the Holy Spirit. To remove them after they had been appropriately and harmoniously added and had become a fixed part of the rite for centuries is nothing less than a repudiation of their theological content and liturgical function, and thus a sin against the Holy Spirit. Sacrosanctum Concilium thus errs in claiming that the liturgy contains “useless repetition” that must be purged. In reality, anyone who enters prayerfully into the repetitions of the old liturgy understands their purpose, which has never presented any difficulty to Christians until the narrowly rationalist and utilitarian assumptions of modern times. 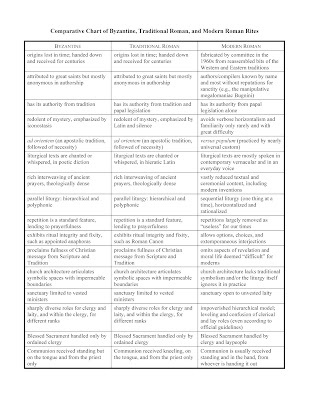 See my article “A Tale of Two Lectionaries: Qualitative versus Quantitative Measures” for more on this troubling aspect of the revised lectionary. The Roman Canon, like the anaphora of the Divine Liturgy of St. John Chrysostom, mentions many saints. The neo-anaphoras severely pare down this homage and appeal. In Sacrosanctum Concilium, however, participation becomes ideological because it is exalted above all other principles, which unavoidably causes distortion and corruption: “In the restoration and promotion of the sacred liturgy, this full and active participation by all the people is the aim to be considered before all else” (n. 14); contrast this statement with Pope Pius X’s Tra le sollecitudini: “We deem it necessary to provide before all else for the sanctity and dignity of the temple.” Perhaps a better concept than participation would be assistance: every member of the body assists at the liturgy, each according to his place. Belonging is a more basic category than doing, just as our insertion into Christ at baptism is more basic to our identity than any particular act we perform. There are a very few moments when the priest can be doing something in the Novus Ordo when the people and/or choir are doing something else: the prayer before the Gospel, during the alleluia; the offertory prayers, if a chant is being sung; the breaking of the host while the Agnus Dei is being sung. But the number of such moments has been severely pared down, and their euchological content has been eviscerated. Just as a chain is only as strong as its weakest link, so a liturgy filled with options is only as good as the worst of these options. It should be judged not by what it might be if many unlikely best choices were to be made, but by what it usually is when customary choices are made. 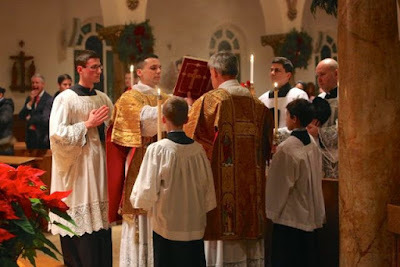 This is not to say, of course, that the traditional Roman rite will always be offered in an edifying or aesthetically appropriate manner — but that is not something that can ever be guaranteed in any rite, for we are still dealing with human beings in their variety and frailty. Rather, I refer to the rules and customs that govern the ceremonies as such. From the forthcoming revised and expanded edition of The Heresy of Formlessness (Angelico Press, 2018), 187. Elsewhere in the same book Mosebach says: “It is characteristic of this century that just as the axe was being applied to the green tree of liturgy, the most profound insights into liturgy were being formulated, albeit not in the Roman Church but in the Byzantine Church. On the one hand, a pope dared to interfere with the liturgy. On the other, Orthodoxy, separated from the pope by schism, preserved the liturgy and liturgical theology through the terrible trials of the century. For a Catholic who refuses to accept the cynic’s easy conclusions, these facts produce a baffling riddle. One is tempted to speak of a tragic mystery, although the word tragic does not fit in a Christian context. 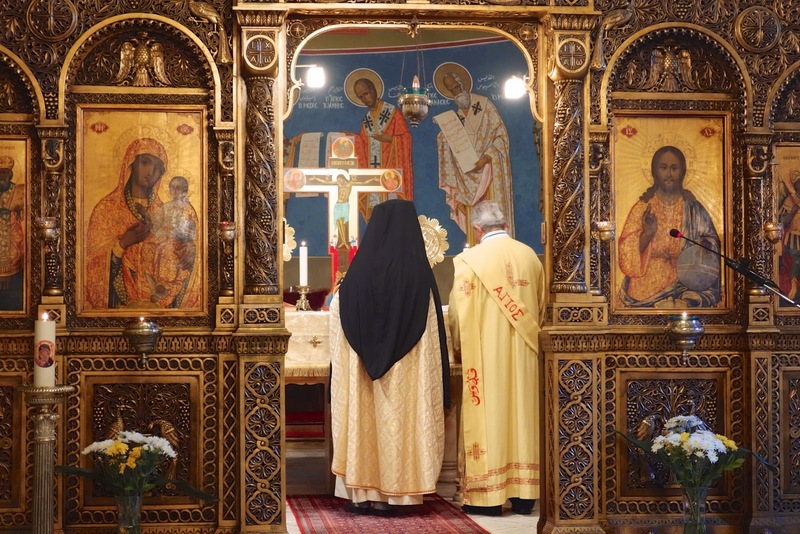 The Mass of Saint Gregory the Great, the old Latin liturgy, now finds itself on the ‘lunatic fringe’ of the Roman Church, whereas the Divine Liturgy of Saint John Chrysostom is alive in all its splendor in the very heart of the Orthodox Church. The idea that we have something to learn from Orthodoxy is not a popular one. But we must accustom ourselves to studying — and studying thoroughly — what the Byzantine Church has to say about sacred images and the liturgy. This is equally relevant to the Latin Rite; in fact, it seems as though we can only get to know the Latin Rite in all its Spirit-filled reality if we view it from the Eastern perspective” (57). Breathe with both lungs, yes — but in their healthy condition, not their diseased condition. Prompted by comments on this article, I am now questioning the accuracy of my claim that the use of the vernacular is as characteristic of the Eastern rites as it is of the Novus Ordo in its vast number of translations into modern languages. Yes, in many linguistic spheres the vernacular will be used (as when the Divine Liturgy is offered in English, as throughout the United States), but there are far too many exceptions. 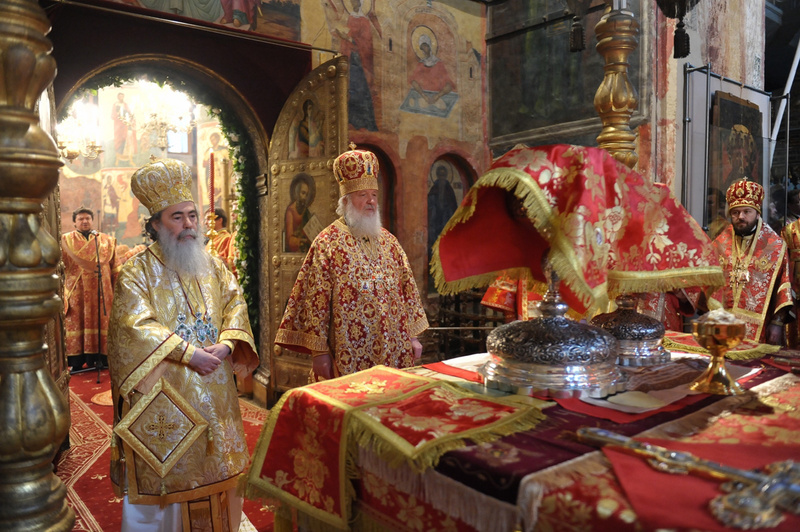 Greek speaking churches/patriarchates use liturgical Greek, not vernacular. Some patriarchates use Arabic and others alongside Greek. Slavic Orthodox churches have always used exclusively liturgical Church Slavonic. Recently, Eastern modernists managed to introduce vernacular, but not everywhere. Russians still use only Slavonic. Even though Serbians, Bulgarians, Macedonians, Belarusians, Ukrainians use much vernacular, Slavonic is still in use. The Romanian Orthodox Church used Church Slavonic/liturgical Greek from 10th to 17th century, when it was replaced by Romanian (which was nevertheless influenced by Church Slavonic, making it quite non-vernacular). The Georgian Orthodox Church uses old literary Georgian as liturgical language. The Coptic Orthodox use literary Coptic language as liturgical language. Even though its use diminished during long Muslim rule (replacing it by Arabic), it's still alive and it's being reintroduced. The Ethiopian Orthodox use Ge'ez as liturgical language, not one of many vernaculars. The Syrian Orthodox use classical Syrian and Arabic. Use of Arabic is related to centuries of Muslim rule. The Armenians use a classical literary Armenian. Moreover, what do we mean by "vernacular"? 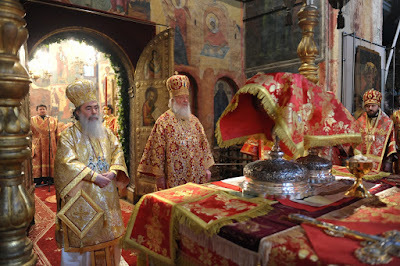 Old Church Slavonic, for example, was created so that the Slavs could understand the liturgy, but at the same time, it was created to translate a very fancy liturgical Greek. And historically, in most cultures there was by definition a large gap between literary language and spoken language, much larger than is typical today, both because more people today are literate, and because high literary language has basically disappeared. A reader sent me this link, which supports many of the points made in this article by its well-chosen alternating clips from traditional Roman and Orthodox liturgies.